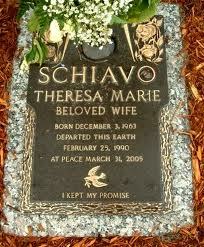 Today is the anniversary of the death of Theresa Marie Schiavo. Terri Schiavo masses away on March 31, 2005 in a Florida hospice after her 14 day battle against starvation and dehydration after being taken off her feeding tube. God continue to rest her soul and have mercy on all of us. For those who were not with Scared Monkeys from the outset, the Terri Schiavo life and death tug-o-war was the story that put Scared Monkeys on the blogging map. I know many think it was the disappearance of Natalee Holloway; however, that was not the case. Before Scared Monkeys wanted “Justice for Natalee”, we fought to help keep Terri alive and covered the events that sadly eventually led to Terri Schiavo’s passing. We believed as did President George W. Bush commented in his statement that, “where there are serious questions and substantial doubts, our society, our laws, and our courts should have a presumption in favor of life”. The case of Terri Schiavo raises complex issues. Yet in instances like this one, where there are serious questions and substantial doubts, our society, our laws, and our courts should have a presumption in favor of life. Those who live at the mercy of others deserve our special care and concern. It should be our goal as a nation to build a culture of life, where all Americans are valued, welcomed, and protected – and that culture of life must extend to individuals with disabilities. Sadly we posted, ‘STRIKE 3, 11th Circuit Court Rejects Schiavo Appeal’ … “It looks like the last flicker of a hope has gone” that was picked up by CNN and broadcast on the TV program, Inside the Blogs. As stated at Blogs for Terri on the 6 year anniversary of Terri’s passing … despite the intervention from Florida Legislature, Gov. Jeb Bush, Congress and President George W. Bush, the courts picked death over life. Pinellas-Pasco Circuit Court Judge George Greer’s latest death order concluded an 11-year tug of war over Schiavo’s life waged by divided family members, and came despite the unprecedented intervention of first the Florida Legislature and Gov. Jeb Bush, and then Congress and President George W. Bush. Terri Schiavo Life and Hope Network. Hardly a day goes by that I do not think about a US Court decision that chose the death of a US citizen over life. It is a haunting and uneasy feeling that such a decision was made without any consent or feedback from the victim of the decision. Long before there was Obamacare, there was this precursor of making decisions on death. All I can say is Terri, God Bless your soul!!! Rest in Eternal Peace. Robert Schindler, the father of Terri Schiavo, passed away over the weekend at the age of 72. According to reports Schindler died of apparent heart failure. However, in the aftermath of the death of his daughter Terri Schiavo and the much publicized 13 day starvation and dehydration death, one might say that Robert Schindler died of a broken heart. For those of you who have forgot or are unfamiliar with this case, Terri Schindler Schiavo died on March 31, 2005 after courts ruled that her feeding tube could be removed. After a 14 day battle against starvation and dehydration, Terri Schindler Schiavo died. It was the story that captured the attention of America and brought to light the rights of patients, family, living wills and what humanity should take place for those that would want one to die vs. those that would wish to take care of her. The right to life for patients battles on after the death of Terri through the Terri Schindler Schiavo Foundation. The story of Terri Schindler Schiavo has a special place in our hearts here at Scared Monkeys as it was the first true impactful, emotional and far reaching news story that we covered. Let alone the emotional, heart breaking nature of the story. 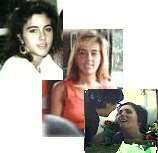 Before Natalee Holloway there was Terri Schiavo and her parents only wish to have her live. We sadly wrote a story on the day that the 11th Circuit Court rejected her parent’s last appeal to get the brain-damaged woman’s feeding tube reconnected … “STRIKE 3, 11th Circuit Court Rejects Schiavo Appeal”. CNN’s Inside the Blogs picked up the story. Robert Schindler will now be able to be with his daughter once again. May they both Rest in Peace. A Polish railway worker who was hit by a train 19 years ago has emerged from his coma. The man, Jan Grzebski, went into a coma when Poland was still being run by the Communists under the power of the Soviet Union. Now he has emerged into a world of capitalism, a member of NATO, and freedoms he has never dreamed about. It is a great example of the Rip Van Winkle syndrome, and why we should never give up hope for those who go into a coma. Railwayman Jan Grzebski fell into a coma after he was hit by a train in 1988, the private channel Polsat said. 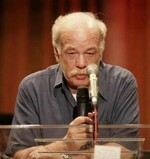 In an interview, Grzebski said that he owed his survival to his wife, Gertruda. “She’s the one who always took care of me. She saved my life,” he said. 10:00 EDT: Just in from Fox News … Terri Schiavo has passed away in her Florida Hospice. After a a 14 day battle against starvation and dehydration, Terri has passed on. God Bless you, Theresa Marie Schiavo. You are in much better hands now than you were just an hour ago. God take care of you & bless you. More from Wizbang including a nice photo tribute. I find it almost impossible to believe that with the support of both Republicans and Democrats, with worldwide media attention and with access to both state and federal court systems, Terri’s family was not able to save their daughter. I too, must sit back and reflect on my feelings regarding this matter. God bless you Terri, and may peace be with you, your family and friends and all the people who have supported you and been your voice along the way. UPDATE: My buddy James Hudnall has a great perspective on the matter and since I border on sorrow and anger right now I may have to defer to his well written and thought out point. Go to Michelle Malkin very a very nice post on Terri. Nice touch. With time running out for Terri Schiavo, a federal appeals court Wednesday rejected her parents’ latest attempt to get the brain-damaged woman’s feeding tube reconnected. The Atlanta-based 11th U.S. Circuit Court of Appeals agreed to consider an emergency bid by Bob and Mary Schindler for a new hearing in their case, raising a flicker of hope for the parents after a series of setbacks in the case. But the court rejected the request 15 hours later. Three times last week, the court also ruled against the Schindlers. It looks like the last flicker of a hope has gone.